Washington, DC — Transportation is vital to trade and commerce, and of course necessary to the movement of people who transact in goods and services. Transportation infrastructure—including roads, rail, bridges, and airports—is crucial to spur economic and social activity within individual countries and to support regional integration within Africa. In recent years, new developments in the technology sector have shaken-up the continent's transport industry. Many innovations in the transport sector – from drones and apps to payment and tracking mechanisms – are becoming more widely available and are reducing the time and cost of transportation. Panelists will discuss the innovative technologies that are positively "disrupting" the transportation space and highlight novel and well-tailored incentives for transportation project developers and investors across the continent. 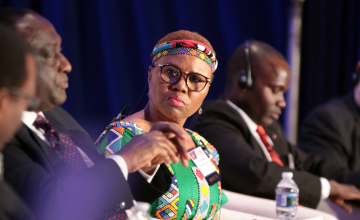 Corporate Council on Africa (CCA) will host the U.S.-Africa Infrastructure Conference on November 5-6 in Johannesburg, South Africa. CCA's Infrastructure Conference will showcase innovative solutions in ICT, energy and transportation to U.S. and African government and private sector actors and highlight novel approaches that infrastructure leaders have implemented to make ambitious projects a reality. Attendees will include African and U.S. government officials, private sector representatives, investors, financiers, project developers and senior representatives of bilateral and multilateral financial institutions who will share innovative financing approaches and platforms for African infrastructure projects.